These are oh-so-good and simple to make. 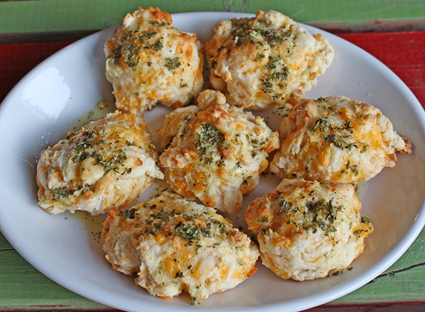 They taste very similar to the Cheddar Bay biscuits served at Red Lobster restaurants. Preheat oven to 450 degrees F. Grease a large cookie sheet. Mix biscuit baking mix, grated cheese, and water together until it forms a stiff dough. Drop large spoonfuls of dough onto cookie sheet (I use a soup spoon- dough is 3 to 4 tablespoons in size). Bake for 8 to 10 minutes until biscuits are light brown on top. Check for doneness with a toothpick. Remove from cookie sheet and place on a large serving platter. While biscuits are baking, measure remaining five ingredients into a glass liquid one-cup measure. Microwave for 10 to 20 seconds to melt the margarine. Stir. While biscuits are hot, pour 2 teaspoons of the Italian garlic flavoring over the top of each biscuit. Serve hot. Makes 14 biscuits. Yum, I can see me eating more than my fair share. YUM! I haven't made these in a while....I think it's time! I do love a biscuit :D Thanks for stopping by!